No Fit hybrid for U.S.
Kohei Hitomi, chief engineer for the Honda Fit hybrid: "I think many Americans would be asking whether it is worth paying extra." 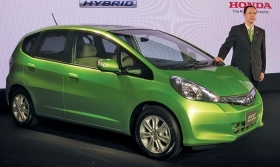 TOKYO -- Honda Motor Co. has decided the Honda Fit hybrid isn't a good fit in the United States -- at least right now. The company has no plans to bring the hybrid version of its small car here, doubting U.S. drivers will pay more for its gasoline-electric drivetrain. The hybrid Fit went on sale in Japan on Oct. 8. Europe gets it next year. Executive Vice President Koichi Kondo said Honda has held off on a U.S. debut, in part because gasoline prices haven't risen as quickly as expected. "As for the future, it's open to question," Kondo said at the Fit's launch event in Tokyo. We will carefully be watching the market situation." Honda has wrestled with a fickle U.S. market for hybrid vehicles. While the Toyota Prius has racked up healthy sales, Honda's offerings, such as the Insight and CR-Z sporty hybrid, have missed expectations. Relatively stable fuel prices have made U.S. drivers leery about paying more for the hybrid technology, even if it means better fuel efficiency. Kohei Hitomi, chief engineer for the Fit, said Americans used to big cars probably aren't willing to pay the hybrid premium for marginal fuel economy gains in a compact vehicle. "The gasoline Fit gets very good mileage as it is," he said. "I think many Americans would be asking whether it is worth paying extra." In Japan, the hybrid Fit starts at ¥1.59 million ($19,275), about 29 percent more than the restyled gasoline-only version.It delivers 70 mpg under Japan's testing cycle, compared with the nonhybrid's 57 mpg.